You'll be able to do more with this than with an iPad – even taking the scarcity of Windows 8-specific apps into account – but you won’t be able to do it more speedily and without some frustrations with the interface. Just a few short years ago if you described a Windows computer with a 10-inch display running on an Intel Atom processor, you were most likely describing a netbook. Nowadays, that description is even more rare, and when it does crop up – as in the case of the Asus VivoTab Smart – it’s more likely to describe a tablet. Slates rule the world right now, but some of us miss those inexpensive little computers that defined portable computing before the iPad came along to disrupt (or ruin, depending on your view) everything. Is the VivoTab Smart the salve for that longing? It can be. However, the ways in which this 10-inch Windows 8 tablet remind us of netbooks aren’t all positive. Most Windows 8 tablets on the market go for the 11.6-inch display size, so it’s nice to see Asus going a bit smaller with 10.1 inches. 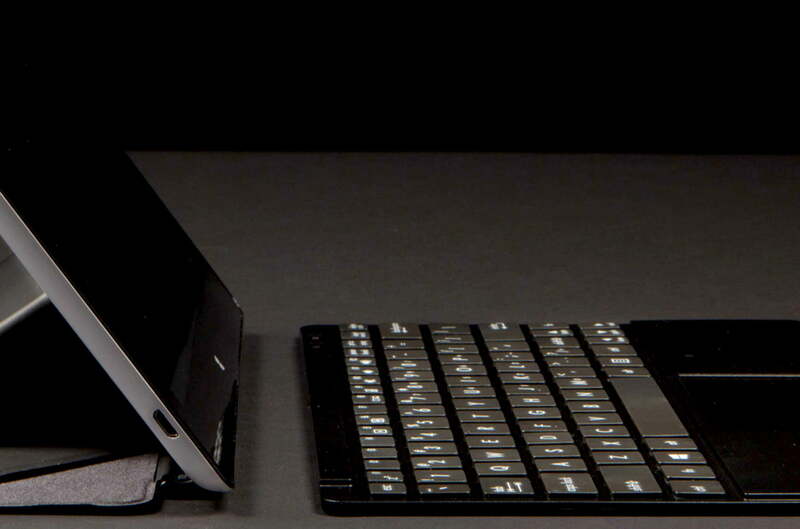 This is the size most people associate with larger tablets and is easier to handle than most 11-inchers. 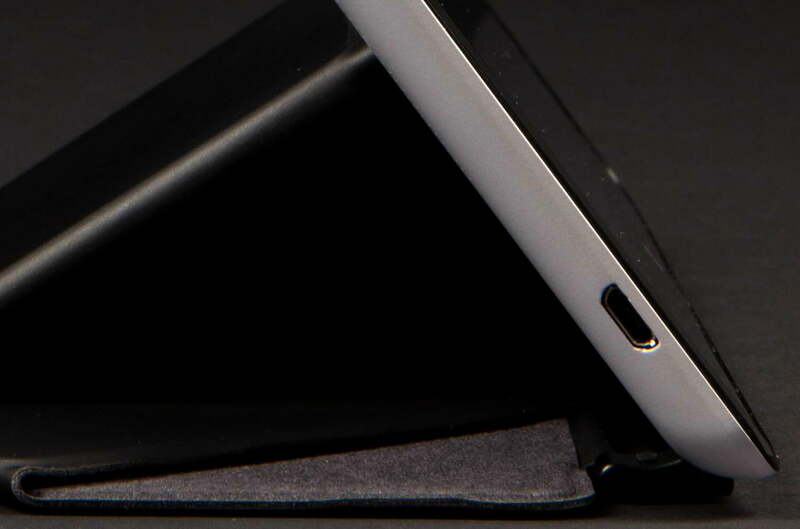 Measuring only a half an inch thick and weighing just 1.2 pounds, the VivoTab Smart is very svelte. We found that it didn’t tire our arm out to hold as quickly as some bigger slates. Even with the keyboard companion, it’s still light enough to tote around all day in a small bag. You won’t have to worry much about finger smudges on this touchscreen. 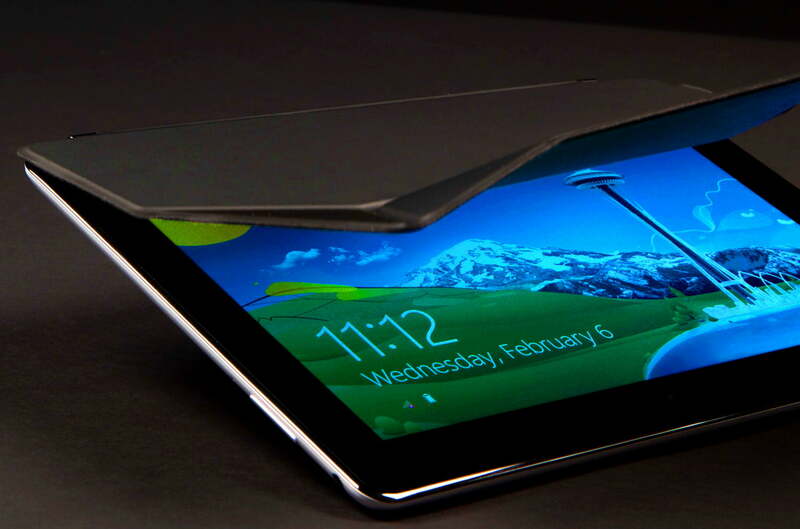 There’s nothing flashy about the VivoTab’s look. It has a simple design with an unadorned front (except the Windows button) and a smooth back that comes in black, white, or red. Tapered edges make for comfortable holding in both orientations, and the buttons along the top and side are raised just enough to feel by touch. Push down on the back and you get a bit of flex, but only if you’re looking. The build doesn’t feel creaky or cheap. 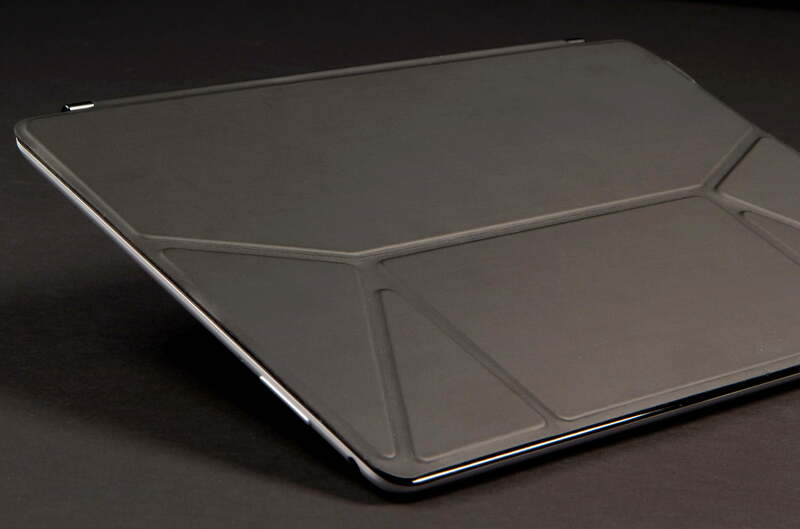 Overall, the tablet gives the impression of being well made, even if the back is plastic. 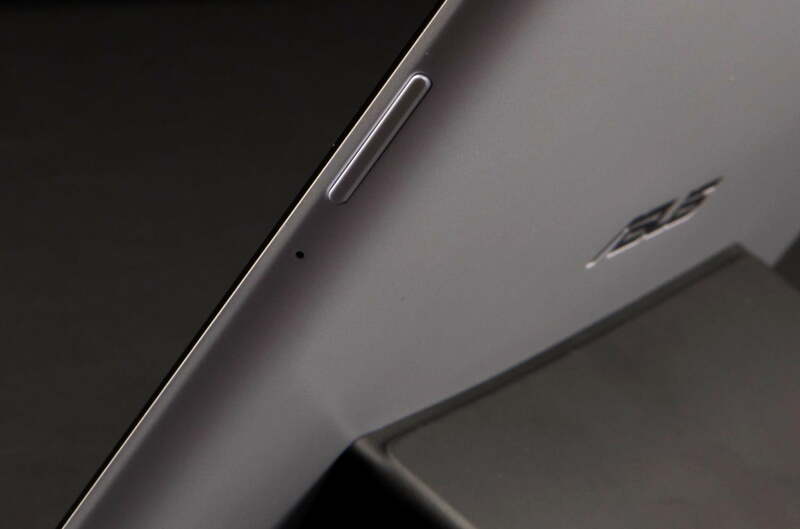 The VivoTab Smart’s slimness comes at a price: ports. There are only four ports in total: Micro USB for charging, Micro HDMI for A/V output, Micro SDHC card slot, and a combo headphone/mic jack. Android tablets usually offer about the same number of ports (or less), and that’s acceptable; however, on a Windows 8 tablet, particularly one with full Windows and not RT, this can be a big drawback. Downloading files, media, and programs – especially big ones – can be time-consuming. Sure, the tablet includes multiple wireless transfer options – Wi-Fi, Bluetooth, even NFC – but the world is not completely wireless yet. The ability to plug in a flash drive or an external hard drive is still valuable. Not to mention peripherals. To do that, owners will have to invest in a USB OTG (On The Go) dongle that allows them to plug in USB devices. The lack of USB port is even more glaring when compared to the 10.1-inch Lenovo ThinkPad Tablet 2 and the 10.6-inch Microsoft Surface, which both have a USB port. Given that even Microsoft recognizes the need to plug things in, Asus could have at least included an OTG-compatible USB cord in the box with the VivoTab. The 10.1-inch display has a respectable 1366 x 768 resolution. It’s not going to blow your mind with pixels, yet it’s still just fine for reading, browsing, and playing games. The IPS panel offers wide viewing angles, and the colors and blacks are bright and deep. The glossy coating means reflections will be an issue in some lighting conditions. And since it’s a less-than-300-nit-brightness display, it doesn’t get bright enough to make it very good in sunlight. You won’t have to worry much about finger smudges on this touchscreen. We only had to clean it every couple of days, if that. And the touchscreen itself remained responsive and accurate where the system performance allowed. Accuracy is much appreciated when dealing with Windows 8. The VivoTab Smart, like the Surface Pro and the ThinkPad Tablet 2, runs the full version of Windows 8 and not RT. That means you’ll get mostly the same experience here as with a laptop running the same OS. And you can load pretty much any program for Windows, even the ones made for older versions. If you stick to the touch-friendly interface (once called Metro), you won’t encounter usability problems; but run things in Desktop mode and the touch experience is less comfortable. And, unlike the ThinkPad Tablet 2, there’s no stylus to help get at tiny elements and menus. Much of the time we were able to tap around with no problem, but when menus or icons proved too small, it became frustrating to try to get at them. Moments like these are what the external keyboard/touchpad are for. 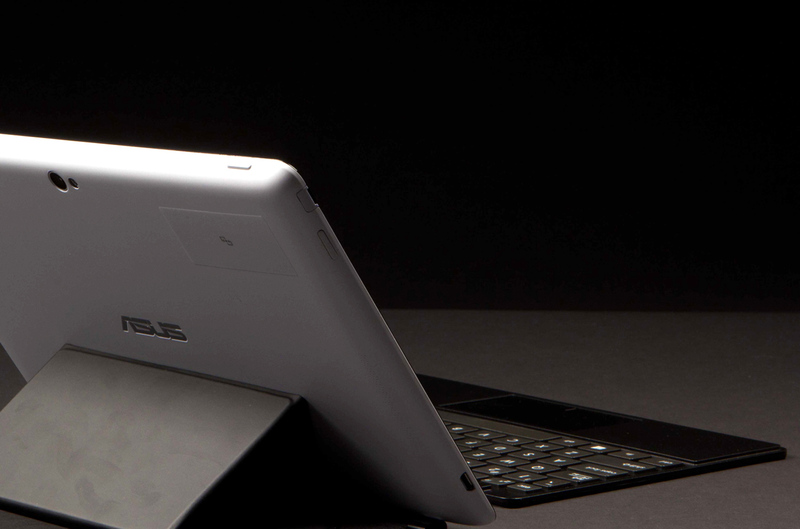 Asus sells an extremely thin and light Bluetooth keyboard bundled with a TranSleeve cover that attaches to the VivoTab magnetically. The combo costs $100 extra, and we highly recommend it if you intend to use the tablet for anything more than games and videos. The keyboard has the same footprint as the VivoTab and looks a lot like the ones found on Asus netbooks – including the annoyingly shrunken Shift key on the right. The keys are a bit small and have plenty of space between them, so typing accurately is possible once you get used to the size. There isn’t much travel due to how very thin the accessory is in the end. Still, you’re better off with this than the on-screen keyboard in landscape. Unlike the VivoTab RT or the Surface, the keyboard doesn’t attach to the VivoTab Smart at all, not even to act as a smart cover. Thus, it also doesn’t automatically go to sleep when the screen is off. Depending on how you store it for carrying, you may turn on the tablet and find random numbers and letters in text boxes. The touchpad underneath the keys is far larger than the one on the Surface’s keyboard cover and thus a little less frustrating to use. 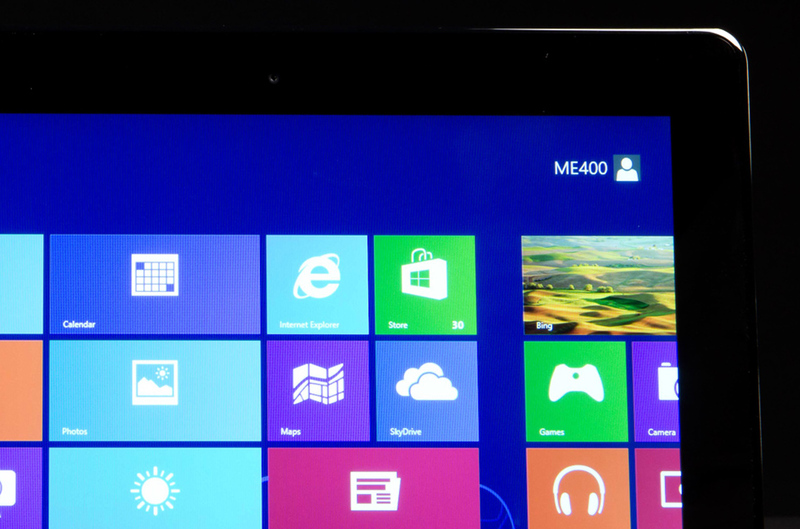 It’s a multitouch job that can pull off proper Windows 8 gestures as well as regular functions. You’ll want to turn off gestures, though as the touchpad surface is still pretty small, and the gesture zones are very easy to activate when you aren’t trying. Plus, the click zones for left and right mouse button functions require such precision that the mouse often acted in ways we did not want. Adjust mouse settings out of the box to avoid this and use the touchscreen as much as possible. Do you need the keyboard to get around the VivoTab Smart? Absolutely not. However, as much as Windows 8 is designed for touch, when inputting longer text, the on-screen keyboard not only gets in the way, but it’s also not always the most comfortable to use when holding up the tablet. In portrait mode, you can reach across the screen with thumbs, but the keyboard isn’t designed with this in mind the way it is on an Android tablet or an iPad. Asus doesn’t clog up the VivoTab experience with too many custom apps. There are a few basic ones included plus a guide for users new to the device and to Windows 8. Owners have the choice of installing apps from the Windows Store or downloading apps made for Vista or 7. The Store is a mess right now, but it’s where you’ll find apps made for the touch environment. Vista and Windows 7 apps load in Desktop mode. Oh, and if you’re looking for Microsoft Office, be prepared to shell out some money. It doesn’t come included with the VivoTab as it does on Windows RT tablets. Though it isn’t made for touch environments specifically, LibreOffice is a good alternative. Don’t go too crazy downloading apps; there’s only a 64GB solid-state drive inside the VivoTab, and only around 30GB of that is available for apps and files. Here’s where the netbook vibe returns. The VivoTab Smart runs on a 1.8GHz Intel Atom Z2760 processor and 2GB of RAM. The Clover Trail platform is more powerful and efficient than the Atom chips in the netbooks of yore, but overall performance is noticeably sluggish. The VivoTab often takes a second to respond to taps and lags just enough to be noticeable but not enough to make it hard to use. Running any complex programs will cause it to slow down further. Running content that utilizes Adobe Flash also slows or freezes the system. On PCMark 7, the tablet scored 1,402, which is just a few points below the ThinkPad Tablet 2 and is on par with other Atom-based Windows 8 tablets. SiSoft Sandra’s Processor Arithmetic test turned in a combined score of 8.2 GOPS and 7-Zip recorded a total of 2,756. It can’t compare to the scores of the Surface Pro, which has an Ultrabook-like Core i5 processor (and is also far more expensive). This Atom processor does have some positives. Though the VivoTab is thin, it doesn’t get much hotter than 86 degrees, even when streaming full screen video; plus, there’s also no fan noise. You’ll also get good battery life thanks to how efficient it is. It lasted just over 8 hours on the Peacekeeper battery test. 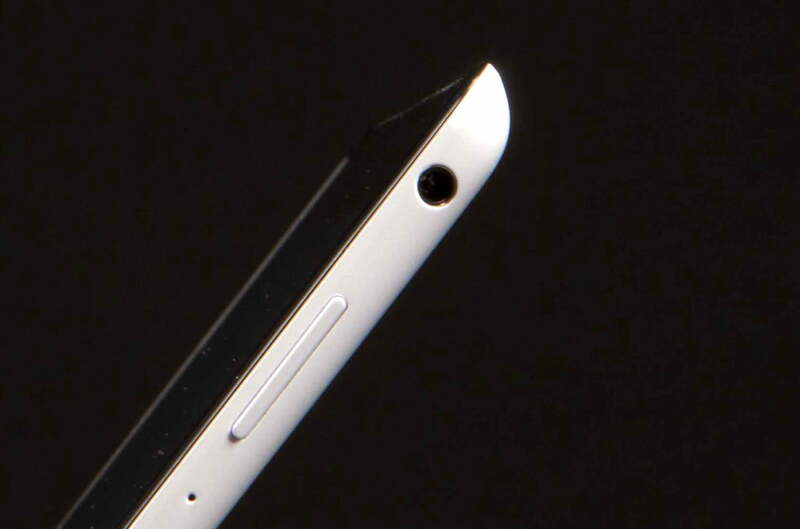 The rear-facing 8-megapixel camera is about the same quality as you’ll find on most smartphones. It’ll take pictures that will look fine on social networks but will show noise when viewed at full resolution. The real problem with this camera is that it’s not on the front of the tablet. This is a problem with Android tablets too, but it’s sort of understandable since they evolved from phones where the better camera should be on the back. However, in a Windows environment, taking pictures of other people isn’t as important as a good camera for video chatting via Skype, Google+, and the like. Still, the 2-megapixel camera on the front is all right for this and captures accurate colors and decent detail. If you’re going to video chat, play music, or watch video, you should probably invest in some good headphones along with the VivoTab. There’s only one speaker on the back and it’s easily overwhelmed in environments with a little background noise. Audio quality isn’t so inspiring, either; par for the course with most tablets. 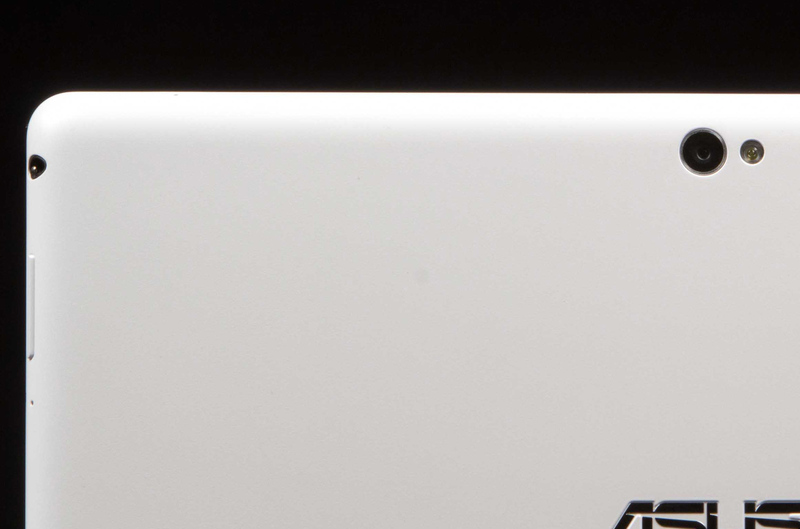 Compared to the competition, the Asus VivoTab Smart, at $500, is on the inexpensive side for Windows 8 tablets. That’s a very un-netbook-like price, though. And if you’re going to use the tablet for real work, you’ll need to shell out another $100 for the keyboard and cover. The balance between performance and portability is tipped a little too far to the latter’s side for something at this price. You’ll be able to do more with this than with an iPad – even taking the scarcity of Windows 8-specific apps into account – but you won’t be able to do it more speedily and without some frustrations with the interface. If a small and light Windows 8 tablet is what you’ve been waiting for and you don’t mind the lack of input ports, the Asus VivoTab Smart is a good choice and less than the ThinkPad Tablet 2 by over $100. But, if you’re just looking for a tablet without a set need for a specific operating system, the iPad and Google Nexus 10 offer smoother performance and run apps designed for a touch experience.